Update: This post has received additional information on how to perform a physical Bell SIM to eSIM swap, which requires a Bell employee to follow specific steps. Dual SIM means two wireless plans can be used on the latest iPhones simultaneously, which makes it handy for users to have a work and personal line active on one device. 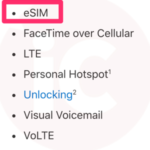 One line is with a traditional physical SIM card, while the second is eSIM, or a digital SIM which you may be familiar with from cellular iPad and Apple Watch models. As for existing Bell customers looking to switch their lines from a physical SIM to eSIM, you probably haven’t heard a lot about this being successful. So if you’ve been puzzled as to why you can’t move an existing Bell line to eSIM, now you know the answer. You most likely need to start a new line on a current in-market plan on eSIM, meaning you would have to give up your discounted or grandfathered plan. To switch to eSim in an existing line a store employee has to pull up your account in FastAct and select the option to do a hardware upgrade, agreeing selecting the device type(LTE) they will uncheck “use existing sim” and in this field enter the EID of the device(starts with 890490). After that they will enter the physical IMEI of the new device and click off the entry box. A radio button will pop up that says “Get Sim”. Clicking this button will generate the “eSIM” that the employee will then copy. After that they close the hardware upgrade screen and go into Sim Replacement. Here they will replace the current sim on the account with the one generated under the “Get SIM” button. After submitting that you turn the phone off and on and go to Bell.ca/eSim – you will scan the QR Code and it will prompt you that “Bell” has a plan ready for you. After that it’s pretty much good to go. For Corporate eSim switch over you need to go to a store and have the agent call into L2 tech support. The L2 tech agent requires the FastAct credentials of the in store agent and will “create” a new corporate activation under your Corporate NAG to generate the new eSim. The rest is similar to consumer in that after selecting “GET SIM” they copy it, cancel out of the activation and do a SIM replacement. Click here to learn how to setup eSIM on Bell or Virgin Mobile with your iPhone XS, XS Max or XR.